On one side Winters gives us beautiful weather where on the other hand it brings lot of dryness in skin. Normally in winter I face dry skin & hair problems regularly. But don't worry all those people who are suffering from Dryness, Today I am going to Review the product which gives you Soft Skin through out the day. I am going to talk about VASELINE Intensive Care Cocoa Glow Body Lotion. As you all know that Vaseline is pretty old & famous brand & they have many different type of Body Lotions with them. Below is my full Review about this product. Last month I came to India for my Long Vacations. For 2 long days I was travelling and was in the Flight which made my skin dry. Then, after coming to India sudden change of weather made my Skin even more Dull & Dry. 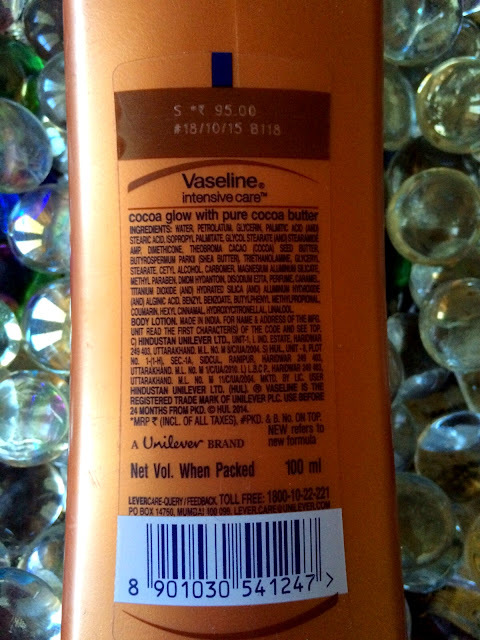 I went to local shops here & after some of the research I picked my product, VASELINE Intensive Care Cocoa Glow Body Lotion. This Lotion I am trying for the first time. I started using this Lotion two times in a day, Morning & Night.And believe me Guys this Body Lotion really proved good for my Dry Skin, as it is keeping my skin moisturized through out the day. I like the non-greasy feeling & its fragrance too. I personally feels that its a good Body Lotion for everyday use. But ya if you have super Oily Skin then this product is definitely not recommended for you guys from my side, because of it's thick texture. My skin becomes very dry in winters. 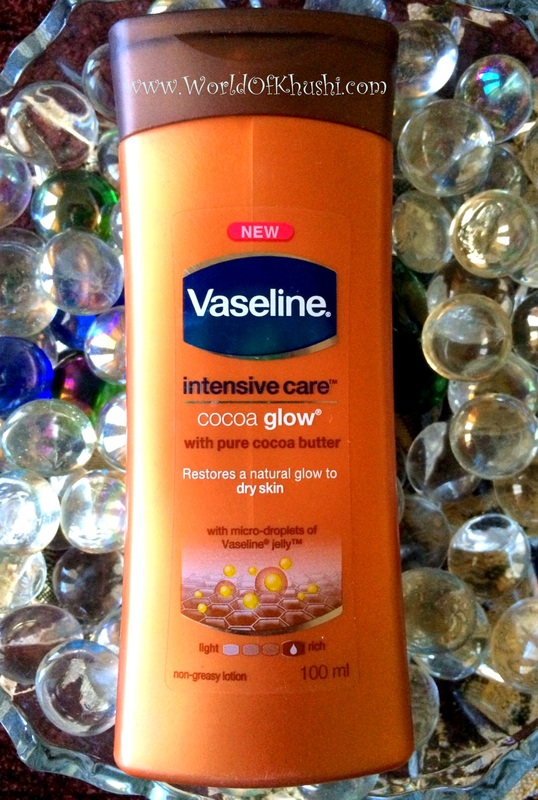 "With pure cocoa butter, restores the appearance of dry skin to reveal its natural glow. - Moisturizes to restore the appearance of dry and dull-looking skin. - Absorbs fast for a non-greasy feel." Apply daily all over your body, particularly after exposure to sun, wind and after shower. 2. Makes skin Soft & Moisturized. 7. Does not get transferred to clothes. 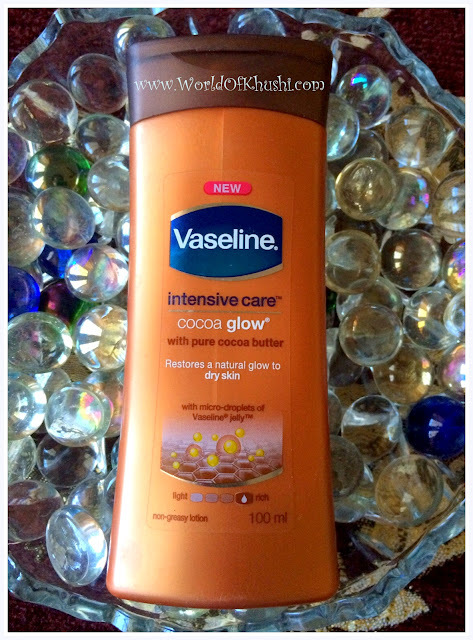 I personally happy with the product but the only problem which I feel in Vaseline Body Lotion is that they are having so many options in Cocoa range which sometimes makes you choice little confusing. Yes ! I love this product. It works for me. This is my full Review for VASELINE Intensive Care Cocoa Glow Body Lotion. 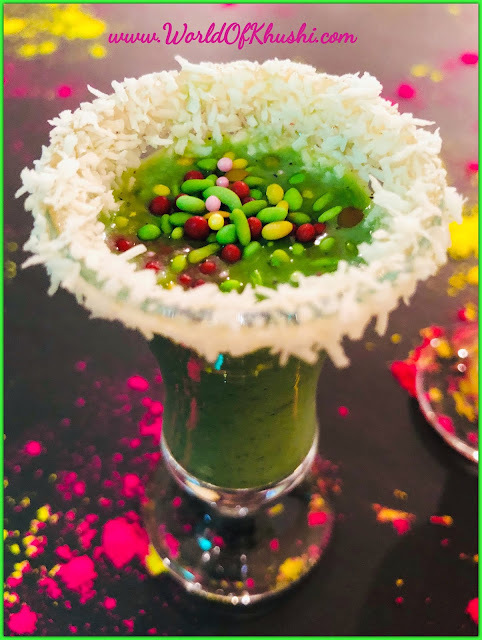 I hope you have got some idea about this product. This works for me & I hope this will work for you guys too. If you don't like the Cocoa smell, then you may don't like the product. Do try & let me know your feedback. All the very best.